If you’re going to invest in an exercise machine that costs nearly $8,000, it might as well have a blood stripe. 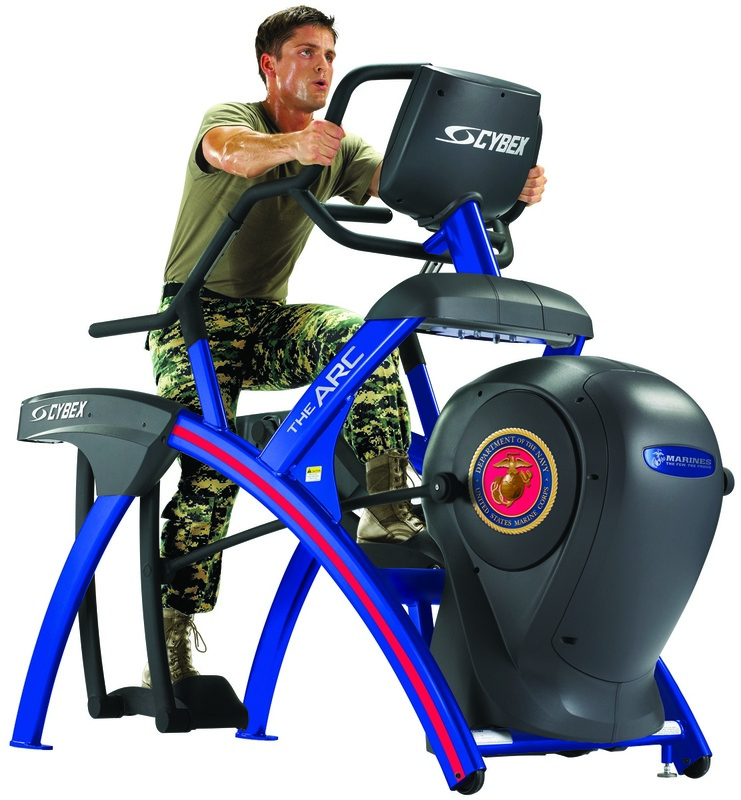 The Marine Arc Trainer, made by CYBEX International, is a workout machine that comes wrap­ped in “dress blue” coloring with a blood stripe and the Marine Corps logo, according to a company news release. The device is described as a “calorie-burning” cross trainer that allows the user to exercise at a range of inclines, “without stressing knees and joints.” The machine also comes pre-loaded with exercise programs oriented to fitness-test requirements. The Marine-themed trainer is the first of what the company says will become a line of service-specific machines. CYBEX also is touting that the machine would help those “overweight teens” who are too fat to serve in the military. The Marine Arc Trainer retails at $7,950. UPDATE: Those of you looking to add this machine to your man cave may be disappointed. Fred Seabright, CYBEX director for government sales had this to say: “Marine customized treatments are ONLY available to Installations who feel that it contributes to improved morale and the overall decor of the training facility and request this customization courtesy.” See more of his comments below. So what do you think of the machine, and its Marine-centric look? I’m sure the PFC making 30k a year will rush out and buy one. 7950.00? That is ridiculous. This company makes good equipment but they are also trying to make a profit by marketing something “USMC inspired”. With such a steep cost, it might be more of an incentive for someone (who actually has the money) to buy if some of the proceeds were going towards the Injured Marine Semper Fi Fund and not directly into the pockets of corporate America. It is a commercial product, super durable, high end performance, the type of thing a base would have to help Marines achieve their fitness requirements. Not the sort of thing the typical Marine would buy–perhaps some retired general officer but…. The Arc Trainer is a commercial product which CYBEX sells to military installations, including those of the Marine Corps. The technology is particularly suited to military training for Active Duty performance requirements including PFT, CFT and pre-deployment because it enables very high levels of strength, power, muscle endurance and calorie burn . CYBEX offers the customization of the Arc Trainer to Marine Corps installations as an option because we believe that Marines working out on Marine colors in a Marine facility is inspirational to the men and women who are working hard to get and stay fit. The customized Arc Trainer is not available to individuals or commercial locations. Marine customized treatments are ONLY available to Installations who feel that it contributes to improved morale and the overall decor of the training facility and request this customization courtesy. I think it’s great Cybax has taken the time to put together a machine that not only provide a great workout but at the same time will save our knees. I obviously cannot afford one of these for my home, but who can these days, that’s why so many people join gyms. And we in the military are fortunate to have top notch facilities at our disposal. That being said, I sure hope those in charge of procurement at my base bring a couple of these to our facilities as I would love to work out on this machine tailored to our branch! I think its great that a corporation can profiteer on us by putting our Eagle, Globe, and Anchor on its machines. Way to go. If i want a red stripe and an EGA I’ll stick to masking tape, red spray paint and a giant EGA sticker you can get anywhere on base. Don’t be lazy Marines, you can run up the stairs. jaws for holding bolts or nuts which ever you prefer. Special price on dress watches. Find out where to buy best price and free shipping. This costs almost 8 grand. A power cage, oly bar and 500lbs of weights will run your 1500 or so, and running is free. I’ve been here a few times and it looks like your blog posts get more informative each time. Keep it up I enjoy reading them. hey there and thanks in your information ¡V I’ve certainly picked up something new from right here. I did on the other hand experience some technical issues the use of this site, as I skilled to reload the web site a lot of times previous to I may just get it to load correctly. I had been thinking about in case your web host is OK? No longer that I am complaining, but sluggish loading cases times will often have an effect on your placement in google and could damage your quality rating if advertising and ***********|advertising|advertising|advertising and *********** with Adwords. Well I am adding this RSS to my email and can look out for a lot more of your respective exciting content. Make sure you replace this once more soon..